Samsung jumped head first into the smartwatch field with the Galaxy Gear. It’s made out of stainless steel for the body and futuristic material for the strap. The heart of Gear is a 1.63″ Super AMOLED touch screen with 320 x 320 resolution (that’s 277ppi pixel density). In a throwback to the S9110 watch phone, the Galaxy Gear features a speaker and mic, so it can handle calls (with a noise cancellation mic), but also understand voice commands with S Voice. Unlike the rumors, the Samsung Galaxy Gear does not run Android, but needs a connection to a Galaxy device – Galaxy S III and S4, Note II and III, Note 10.1 2014, the older devices (that is not Note III or 10.1 2014) will need a software update.The connection is achieved through power-efficient Bluetooth 4.0 LE. The watch itself is powered by an 800MHz processor with 512MB RAM. A 315mAh battery provides juice for “more than a day”, which is another way of describing the rating of 25+ hours. The watch uses its Bluetooth connection to the smartphone for the Auto Lock feature – if you’re over a meter and a half away, i.e. the phone isn’t in your pocket or backpack, it will lock the phone. The Find My Device feature will help you get your smartphone back by making it beep, flash its lights and vibrate. The Samsung Galaxy Gear features an autofocus 1.9MP camera with a BSI sensor that can capture 720p video. It can even do Sound & Shot snaps. All that is stored on 4GB of internal storage. That’s great for capturing fleeting moments of your life which will be gone by the time you take your phone out of the pocket. With an accelerometer and gyroscope the Gear will also help your workouts by counting your steps and tracking your runs. 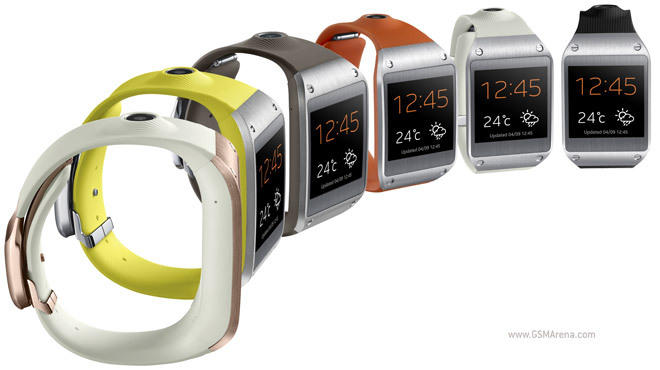 The Galaxy Gear measures 36.8 x 56.6 x 11.1mm and weighs 73.8g. It will be available later this month in most of the world, but the US and Japan will get it in October. Color options for the wrist band include Jet Black, Mocha Grey, Rose Gold, Wild Orange, Oatmeal Beige and Lime Green.